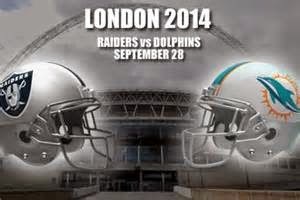 The Oakland Raiders tootled around London for seven days whilst the Miami Dolphins stuck to their usual routine amongst the blood thirsty Miami media and fan speculation. Miami head coach Joe Philbin in an attempted quarterback motivating move, (by not naming his starting quarterback for the week four match up) fueled the jumping to conclusions paparazzi like mob. What does matter! Is that Ryan Tannehill's liver felt the force of Joe Philbins foot to his backside, and responded by leading his team from behind with THIRTY EIGHT UNANSWERED Miami Dolphin points. Oakland took the opening kickoff and drove 74 yards for an early 7 - 0 lead, and didn't score again until a touchdown in garbage time. The Dolphins responded with a field goal to the Raiders opening touchdown and trailed 7 - 3. At this point, Ryan Tannehill proceeded to complete FOURTEEN successive attempts on three Miami Dolphin first half touchdown drives. Miami executed scores on four of their six first half possessions for a 24 to 7 halftime lead. The two possessions that they didn't score on were due to a fumbled punt return in Oakland territory, and a purposeful first half ending kneel down. In facing a 7 - 3 deficit. The Dolphins marched 91 yards that ended in a Mike Wallace TOUCHDOWN on their second possession. Wallace took the screen pass at the 15 yard line, uncharacteristically powered through two defenders at the five yard line, and another at the two for the score in Charles Clay type fashion. Ryan Tannehill went 6 for 6 for 86 yards of the ninety one that led to a 10 - 7 Miami lead. On the Dolphins following drive of 63 yards. Tannehill went 3 for 3 and Miami scored in an aggressive manor from 8 yards out on a Lamar Miller 4th & one TOUCHDOWN play. Fins 17 Raiders 7. After a Miami fumbled punt return possession on Oakland's side of the field, and another defensive stop/Raider punt. The Dolphins marched 90 yards on 9 plays for a 24 - 7 scoreboard advantage. Ryan went 5 for 5 and capped the drive with his fourteenth consecutive completion which was an absolutely beautiful TOUCHDOWN pass and catch of eighteen yards to backup tight end Dion Sims. Miami took a knee on their final first half possession and went to the tunnel ahead by 17 points. Ryan Tanne-THRILL was 17 of 19 for 204 passing yards and two touchdowns with 18 additional yards coming by way of his legs in only the first half of play. The Dolphins took the second half kickoff, and Ryan's second down attempt of a 15th consecutive completion was dropped. No-Matter. On the next 3rd and 12 play he converted a pass of fourteen yards to Brian Hartline for "another Miami Dolphins first down". He drove HIS TEAM seventy yards down to the opponents two yard line before a Lamar Miller fumble at the goal line. Oakland took the ball at their own 20, and NOW it was the Miami Dolphins defenses turn. On a Courtland Finnegan blitz that forced an errant throw, Brent Grimes intercepted the ball at the Raiders 35 and returned it to Oakland's three yard line. Two plays later Lamar Miller neutralized his own previous fumble with his second TOUCHDOWN of the day for a Dolphin lead of 31 - 7. Upon the Raiders next attempt, a bad snap blew by the quarterbacks head and was swooped up by Courtland Finnegan who walked 50 yards for another Miami Dolphins TOUCHDOWN to go up by a score of 38 - 7. The Raiders next possession resulted in Miami's Jimmy Wilson returning an Oakland interception from his own 38 to the opponents 31, (the ball was placed on the 16 yard line after an Oakland personal foul penalty on the play). On the Dolphins first play Ryan Tannehill hit a short pass to Daniel Thomas who scored his first touchdown of the season and Miami's 45th point of the day, but it was reversed by a penalty. On another touchdown attempt during the same possession, Dion Sims had the ball bounce off his two forearms for a Raiders interception, Tannehills first and only of the day. Oakland went three and out. Later down the long and winding road whilst trailing by a score of 38 - 7, Oakland scored a touchdown with 11:50 remaining in the 4th quarter to pull within the games 24 point spread finality. The Miami Dolphins defense didn't have a 2014 interception prior to this game. Late in the 4th quarter Rookie corner back Walt Aikens added a team third interception to the day for the "Jolly Ole Chaps" of the American South East Football Franchise. T'Was like night and day in comparison to Miami's previous contest. The Dolphins stuck to their routine while changing everything with brilliant play calling designed towards the proficiency of Ryan Tannehills strengths. Miami skill players (for the most part) executed to a tee, the special teams showed up, and the defense forced turnovers play after play, after play. Miami totaled 435 yards, (Tanne-THRILL directly accounted for 313 via his arm and legs). The Dolphins accrued 278 yards through the air on 31 passes with Brian Hartline being tops for 74 yards on six catches. Miami had 157 on the ground off of 35 attempts with Lamar Miller leading the way on 12 carries for 64 yards and two touchdowns. The defense had two sacks and forced four turnovers (one for six points) whilst allowing 317 yards, (53 via the ground). The Dolphins punter Brandon Fields had just two attempts on the day. To the joy (in one way or another) of all the attempting to be a distraction media, as well as all the faithful Dolphin fans far and wide. Backup Quarterback Matt Moore did indeed play on this day, (for the last eight minutes of the game) along with the rest of The Miami Dolphins much appreciated backups. Head Coach Joe Philbin learned and understood that his ploy to motivate his young quarterback backfired to some extent by causing noise from the outside. In order to assure his team of such knowledge, he and his coaching staff relinquished their first class seats to the players on the flight from Miami to London! A CLASS MOVE and total team motivator! Now (for at least two weeks through the Fins bye). The media saboteurs and Dolphin doubters must fall on their sword and attempt to LEARN TO APPRECIATE that The Miami Dolphins are quickly LEARNING from their previous mistakes! THANK YOU for an Open-Minded Read, and we look forward to your angle of view !! YEEEEEEE HAAAAAAAA, GIGGGGITTTTY, WOOOOOO HOOOOOO MIAMI DOLPHINS ! !